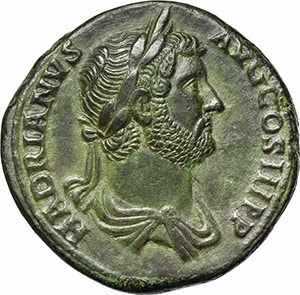 Hadrian's accession to the imperial throne was fogged in conspiracy rumors, mainly centered around his predecessor, Trajan's widow, Pompeia Plotina. Doubtlessly, her intercession aided Hadrian in assuming the throne. Hadrian quickly set about the business of consolidating power and ruling authority. Rather than pushing the boundaries of Rome's empire further as was the practice during previous reigns, his chosen task was to make what Rome already had both run and function properly. He is considered today as an able ruler and administrator. After Jewish rebellions under Titus and Trajan, Hadrian, in a deceptive attempt to integrate the Jews into Roman culture and religious practice, visited Judaea. He promised to rebuild Jerusalem and rebuild the Temple as well. The great deception lay in Hadrian's intention to rebuild the Temple, but to dedicate it to the worship of Jupiter and the person of the Roman emperor. This caused violent rebellion that brought about the involvement of Simon Bar Kokhba. (The Bar Kokhba rebellion itself generated numerous numismatic rarities.) The rebellion of 131 A.D. initially caught Rome off balance. In the end, Rome did not tolerate this type of humiliation, and crushed the Jewish rebellion. Rome even went so far as to rename Judaea as Palestinae to further degrade the Jewish identity. Doubtlessly, one of the most enduring contributions of Hadrian's reign became known as "Hadrian's Wall", which served to delineate the geographical limit of Roman rule in Britain. Hadrian's heir and successor was Titus Aurelius Fulvius Boionius Arrius Antoninus (quite a tongue twister! ), who is commonly known as Antoninus Pius.